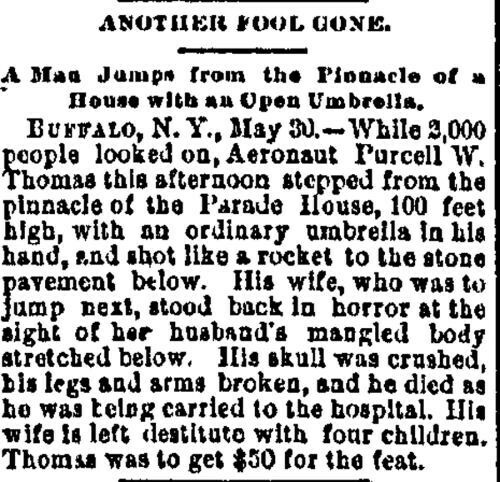 Charlotte Observer, June 1, 1891. As I'm sure you already know, March is National Umbrella Month. Who promulgated this holiday, and when, and why, are scarcely matters I care to probe. Invented traditions are good enough for me when they contribute some supplementary meaning to the depleted terminal months of a Chicago winter. But on a strictly PSA level, I guess I'd like to point out that umbrellas are swell when used as directed, and even have some utility against the hostile rays of sun, but that the whole Mary Poppins angle just doesn't fly. So don't try this at home.